Mt. Pleasant, PA (May 29, 2018) – For over thirty years, ITSENCLOSURES (Integration Technology Systems) has been the front-runner in designing and fabricating unique computer and monitor enclosures, including the NEMA 4X ID42 desktop enclosure. The 304 stainless-steel (#3F vertical finish) IceStation ID42-4X pc/monitor enclosure is designed to meet the challenges of the harshest environments. The desktop ID42-4X will safely enclose a monitor, computer, mouse, and keyboard in a manufacturing environment, while protecting electronics from dust, dirt, hose directed fluids, and corrosive materials. The enclosure measures 42-inches high by 26-inches wide by 26-inches deep. The sloped-top (15-degree slope) pc enclosure is ideal for wash down applications in the food, beverage, and pharmaceutical industries. The sloped design eliminates water pooling during the wash down process and helps protect against bacteria. The ID42-4X can be placed on a desk, workspace, table, or mounted on a stainless-steel mobile or bolt down pedestal. Standard features for the clean, stainless steel enclosure, include: a ventilated, adjustable shelf (stainless steel) to offer flexibility when positioning equipment, a dual-level, integrated roll-out keyboard/mouse drawer - with tool-less cable access - provides a convenient workspace, and a tempered safety glass or Lexan polycarbonate viewing window (16-inches high by 19-inches wide) designed to accommodate a 25-inch display. The front and rear doors provide a two-point latching - with keylock - for security and allow equipment to be easily accessed. The rear door opening measures 30-inches high. An optional sealed cable entry gland can be installed for dust-free/water-tight wire and cable exit. The gland has multi-diameter modules with a frame and compression unit to seal the cable/wire penetrations. “The innovative ID42-4X has been in our rugged product line for many years and continues to sell well on the industrial side of our business. Our stainless-steel products are always built to last 'forever and a day' and will protect expensive electronics in most environments, both indoors and outdoors,” said JT Spangler, Owner and President of ITSENCLOSURES. “Our products can be found in factories and manufacturing plants across America and we could not be prouder of the longevity and durable nature of everything that we fabricate,” continued Spangler. To help extend the life of the electronics stored inside, ITSENCLOSURES offers multiple thermal management options. An “outdoor” filtered fan system will create positive pressure inside of the enclosure and eliminate damaging dirt and dust entry. For more extreme environments, a NEMA 4X heat exchanger, air conditioner, heater, or a vortex cooling unit are available. Additional add-on accessories include: sliding shelf brackets, a 6-outlet surge protector, and an extra shelf kit. ITSENCLOSURES fabricates the most heavy-duty computer enclosures in the enclosure industry and ships products completely assembled and ready to use upon delivery. Located southeast of Pittsburgh in Mt. Pleasant, Pennsylvania, ITSENCLOSURES designs and builds the toughest manufacturing enclosures on the market. 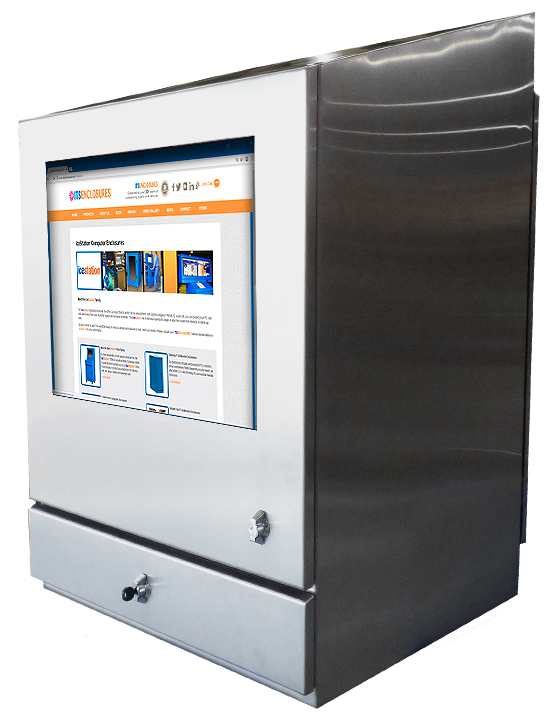 ITSENCLOSURES' line of pc enclosures, printer enclosures, monitor enclosures, electrical enclosures, server enclosures, and LCD enclosures protect a company’s investment and maximize electronics’ lifetime. ITSENCLOSURES’ products are always ‘Made in the USA’ and allow companies to safely use any electronics in the harshest operating environments. Since 1985, ITSENCLOSURES has been helping companies protect technology investments and realize the maximum life cycle of equipment.